Ever wanted to start a food blog or wondered what’s it’s like to be a food blogger? How do we come up with those recipes? Are those photo for real? And do we actually eat ALL.THAT.FOOD? Get ready. Because, this week we’re going behind the scenes at You Totally Got This. So, if you want to start a food blog, are already a blogger or just enjoy a good snooperoo (which I’m totally cool with BTW)…this is how it all goes down at YTGT. Because that’s a very good place to start – according to only the BEST musical of ALL TIME. My recipes ideas usually come from something I’ve seen in a cookbook or on Instagram or Pinterest. Basically, I look at the time it takes to cook. Say no freaking way. Then find an easier way to do it using supermarket short cuts or by changing up the way its cooked. I hit the kitchen. I’m not sure if that’s how you’re *meant*to do it. 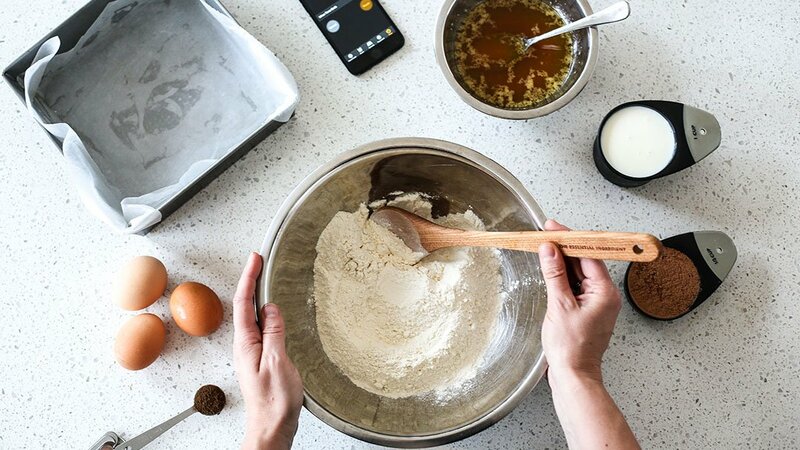 But, before I write the recipe, I set my iPhone timer and give it a go. Sometimes I get the recipe the first time, sometimes it takes a few tries and sometimes I give up because I just can’t cook it in less than 30 minutes. Hello empanadas you, delicious fiddly things. I set up my shot. That sounds so professional. Who even am I? But wait. My photographic studio? The top of the entertainment unit in the living room. Right under the television. Because, where else? A background. Mine’s from FoodBackgrounds on Etsy. I love it. And yes, you can make your own. But if you weren’t paying attention when they gave out the art gene. Buy one. So much easier. Plates and bowls from Kmart. Because we all need more excuses to go to Kmart, right? Cutlery mainly stolen borrowed from my Mum. Grey and white linen napkins and muslin cloths. Seriously, muslin cloths. Not just for babies. They’re scrunch factor is unreal. And yes. Scrunch factor is an *actual* food blogger thing. And all the other stuff I already have in my kitchen like my enamel bakeware, a cast iron frying pan, wooden platters and little biddy bowls for dressing and sauces. I take a few practice shots. So much easier to rearrange things before the food goes on…and I still get food from here to Tokyo EVERY.SINGLE.TIME. Plus, if the practice photos come out dark. Ughhh short winter days. I move the entire thing, so it catches more light. Usually on to the floor under my glass sliding doors. I’d probably take all my shots there, but it sends my furry assistant/notorious food thief- out-of-his-freaking-mind! But, I don’t do anything weird. Rumour is. Food stylists use hairspray to keep food looking fresh. No way. Not me. I mean that would mean you couldn’t *actually* eat the food. Crazzzy!!! I have the will to wait for nothing. So, my photo shoots, FAST. Cos food. Need to eat. Plus, I’ve just switched from mainly using my iPhone to a proper camera and have no *real* idea what I’m doing. My method. Keep fiddling with the settings and shooting at different angles and distances – straight on, 45 degrees and overhead – until I get THE shot (or at least a few shots that will *hopefully* pass as being taken by an actual food blogger). I know that’s probably not much help, if you’re just starting out . My advice….give it a go. The more I shoot, the more I learn and the better my photos get. You can start a food blog, even if you don’t know a lot of technical stuff about photography. I did! Yeah, there’s lots of food bloggers that create amazing images. But, they all started where you are. Just keep it simple and shoot in natural light. You will be amazed what you can create, even on an iPhone. Right now, I’m using a Canon EOS 5D Mark III (with either a 100mm macro lens or a 50mm prime lens). I know, it totally fancy pants. I hit the laptop AND eat ALL the food. Facebook if you’re *actually* filming us through the webcam. Please don’t surprise me with this footage in my newsfeed. EVER! I import my favourite photos into an editing program called Lightroom. It’s kind of like editing your photos in Instagram, only next level fancy. Then I hop over to Photoshop and adjust the height and width of my images (my website fancies images that are 1080 x 680). I also reduce the size of my image files because they are HUGE when they come off my camera. So huge, they have the potential to break the Internet. And seriously. I don’t not want that on my conscious. Next up, I finally get that recipe in my head, down on paper. Once that’s done, I load the recipe and photos on to YTGT and preview the post. You know because crap cakes taste so delicious. There’s always a typo. ALWAYS. All clangers removed, I use an app called CoSchedule to automatically share the recipe on Pinterest and Twitter. To reach as many peeps as possible at different times, I schedule the same recipe to show up maybe 3 to 4 times over a month. Enough to give it a chance of being seen, but not enough to be annoying (at least I don’t *think* I’m annoying. Am I?). Then I air drop any images I’m planning to post on Instagram or Facebook during the week, to my iPhone. And finally. Deep breath. Hit publish. Done. Full disclosure: I like to get all this done in one sitting. But, I’m easily distracted by doggie cuddles, wine and that family starting with K, so hardly ever do. In which case, I just keep working on it during the week until its done. Like, sharing my recipe posts on Instagram and Facebook. I’ve never used a scheduling app for Instagram. Mainly because I like to share a recipe AND discuss the important *cough* news of the day. The Married at First Sight commitment ceremony is important news, right? I’ve also just switched to posting directly to Facebook. I felt like no one was seeing my posts when I scheduled them. Is it working any better? I’ll keep you posted. P.S That super nerdy blog pun was intended. What else? I also submit my recipes to food sharing websites. I usually try my luck with Foodgawker and Tasteologie. They only accept recipes with crazy AMAZING images. My recipes don’t always get accepted. But when they do, I get a serious spike in new readers. It makes feeling like a worthless reject every other week, totally worth it. So how long does it take to put a recipe together? From start to finish. Like 3-4 hours. I know, right? Imagine how much extra Netflix I could watch. It must be love. When do I get all this stuff done? In real life, I work as a lawyer (please, don’t hate me) full time. Most weekends, I spend a solid half day on the blog and my lap top is always switched when I’m sitting in front of the telly at night. Basically, when I’m not at my day job or out eating ALL the food and drinking ALL the wine, I’m blogging. Crazy obsessed? Not really. I love it. And if I wasn’t blogging, I’d be watching season 12 of KUWTK *again*. Blogging is the glue that holds my brain together. Along with peanut butter. Just so you know. Okay? How far in advance are my posts scheduled? Not very. I’m not one of *those* organised bloggers that map out their content way in advance. But, I do tend to think about a month ahead. So right now, I have 4 posts (including this one) almost ready to go. And because I post a new recipe every week, I’m always thinking about what’s coming next. How do ham and pineapple pizza burgers sound? Yup. Thought so! Two words. Bullet journal. Seriously *the* BEST.THING.EVER. The old me? Notes from here to next year. The new *bullet journal* me? Hair in a bun getting stuff done. Now every thought, idea and all the stuff I need to get done is in one place, it’s made a HUGE difference to my productivity. And all you need to start is a blank grid journal and pen. Watch this short video. It will explain everything. In like, 2 minutes. Go! Warning: do not search Bullet Journal on Instagram or Pinterest. You will be unavailable for at least 8 hours and/or will be put off by the BuJu Junkies who make their journals, look all beautiful and fancy. Mine is not. In fact, it’s as boring AF(rank). But, it works. So, don’t let the Junkies talk you out of it. You must start your own Bullet Journal. Now! And no. I’m not part of a Bullet Journal cult. But, thank you for your concern. Do I really eat the food? I either re-heat it and eat when I’ve finished shooting or save it for lunch or dinner during the week. BTW. That’s me. I’m happy. Cos I get to eat ALL the food. You should definitely start a food blog too. It’s okay. I get asked this ALLL the time. Not enough to cover YTGT, or support my Kmart habit. But, last year I managed a few hundy through sponsored Instagram posts (Aussies check out TRIBE and Social Soup if you’re interested in working with brands) and another hundy for referring people through to the I Quit Sugar Program. 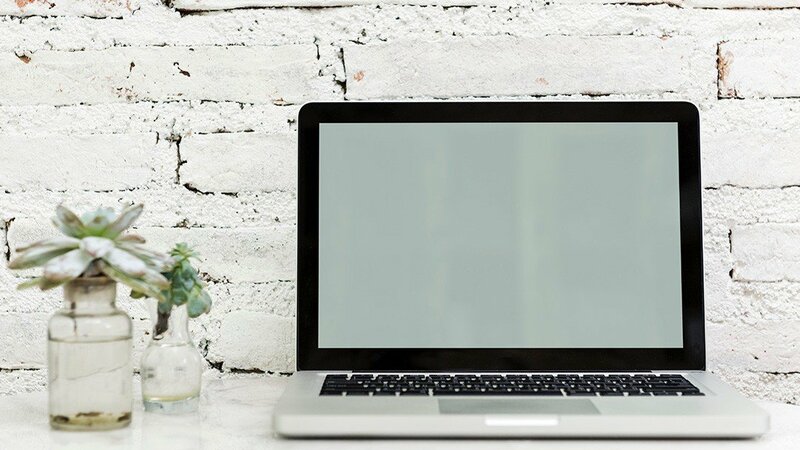 Other bloggers make money through advertising, sponsored blog posts, affiliate marketing and selling their own products and services like books, courses and coaching. Writing my own recipe book is on my to do list. And now I’ve said it out loud, I’ve got to do it, right? In the beginning. No. I set YTGT up myself. If you’re thinking of starting a food (or any kind of) blog. My advice. Watch ALL the You Tube tutorials and prepare for 1 (or 5001) technology induced meltdowns. But, really. It’s sooo much easier than you think. 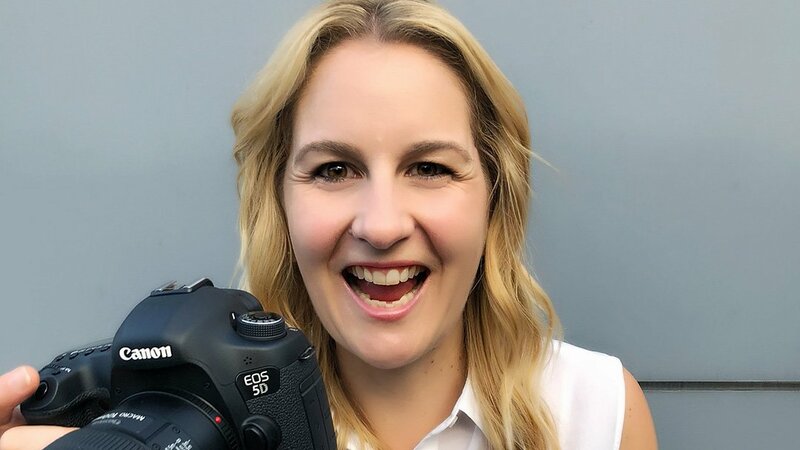 Once, I was up and running, I joined an online bloggers community – the Secret Bloggers Business Boss Squad – that offers 24/7 access to blogging experts and training on literally anything and everything to do with blogging. I’ve stopped subscribing (cos, see answer to “do I make money” above) but, starting out, it boosted my confidence and reduced the amount of life wasted Googling stuff because all the info I needed was in one place. And last year I also got some help redesigning my website from the lovely Linda from Lollipop Creative. Looking for a designer? She is super talented and an *actual* gem. So, you want to start a food blog…. You might have heard of WordPress, Squarespace, Wix, Blogger or Weebly? They’re all blogging platforms. Or in less nerdy speak. The software that allows you to publish things on the web. YTGT is a self-hosted Word Press site. My website is hosted by SiteGround. They own the server (aka the massive real-life computer thingie) that sends YTGT to your computer or phone when you search for a recipe. There are so many reasons SiteGround is the *actual* best. Leave a comment or send me an email if you want to have a chat about why I love them. When you start a WordPressblog, you need to choose a theme. That’s WordPress speak for layout. There are so many to choose from. You *will* lose your mind. I use Divi by Elegant Themes. If that helps. It probably won’t. But, good luck. If your site is self-hosted, you can add special features to your website by installing plugins. My must haves are Yoast, which helps me do all the things that need to do done so YTGT comes up in Google searches and Smush, which reduces the size of your images so they don’t slow YTGT down. I use the free versions and they are AWESOME. I also use the Cookbook plugin, which formats my recipes into awesome printable recipe cards. I pay an annual fee to use that one, but it’s amazing AND super easy to use. Right now, I’m on a mission to crack Pinterest. All the experts say it’s one of the best ways to drive traffic to your blog. Me so far. No luck. But, I WILL crack it. To help, I’m using Tailwind to schedule and post a whole bunch of pins (including some of my own) every day. Tailwind is awesome because you can sit in front of the TV and schedule a months-worth of pins then let Tailwind do all the hard work. I use MailChimp to send my emails. It’s easy to create a super sleek, professional looking email and it’s FREE if you have less than 1000 subscribers. Canva. Best thing EVER! It makes creating graphics for your blog and socials so easy. Basically, you import your image and drag and drop text and other stuff over the top. I use it to create Pinterest images (like the one below), but there’s templates for almost anything. Oh, and did I mention. FREE! I am also in love with OneDrive for storing blog stuff, because I can access it all from the net. That way, if I want to work on something during my lunchbreak it’s all there. Lots of other bloggers use Google Drive and Drop Box which are equally awesome. Now let’s talk. 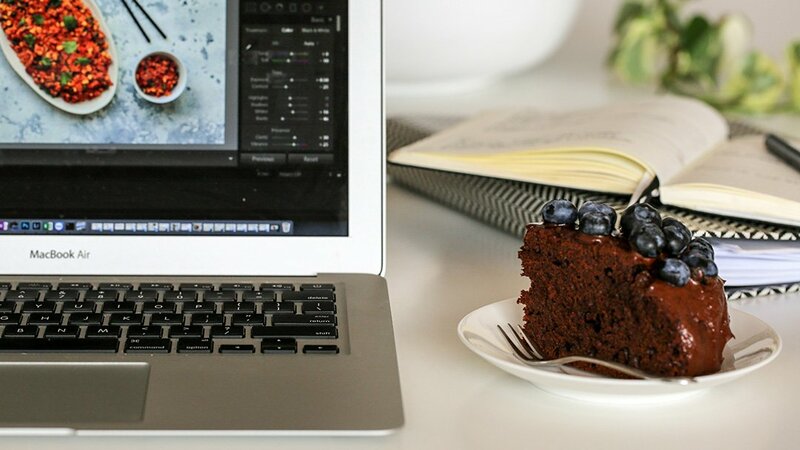 Do you want to start a food blog? What else do you need to know? 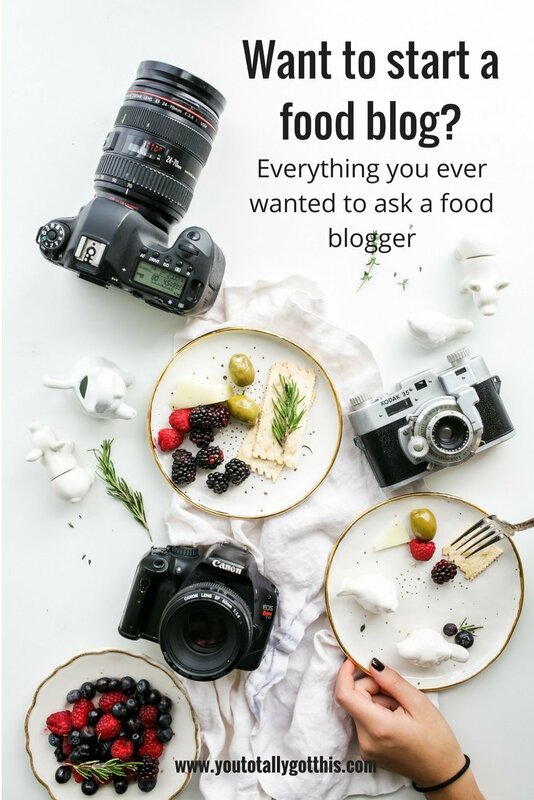 Are you already a food blogger? Am I doing this right? Have you got any awesome tips? So many questions. Talk to me. I’m here. I’m ready. Just so you know. Some of the links to the products I’ve mentioned in this post are affiliate links. That means I may receive a small commission if you click on a link and purchase something. It also means you – YES YOU – are amazing. Plus, we’ll be actual #twinsies when we own the same thing. Hooray! Love it Rani! I’m *SO* glad I’m not the only one who fiddles around with my big girl camera with no real rhyme or reason until I get the shot haha. I have a vague understanding what each setting does but I just play around with whatever until it looks good LOL! As for Pinterest – whatever you are doing at the moment is making you appear in my SmartFeed like HEAPS – so keep it up. That is so good to know about Pinterest. I think I’ve still got some work to do getting the images right for Pinterest. Its on my to do list…in the Bullet Journal. Of course! Thanks so much for checking out the post Cassie. Very helpful, always wondered how to create the recipe layout on a blog. This year I am going to focus on improving my blog, it’s very mediocre at the moment. Might switch to wordpress, as I have been using wix at the moment. I would definitely consider WordPress. My first blog was on wordpress.com but when I started YTGT I took the plunge and went for a self hosted wordpress.org blog. It was a bit of a learning curve, but I’m so glad I went that way. There is literally a plugin for everything and I’ve found that its really helped with my rankings on Google searches. Let me know if you have any questions when you start looking into it. Great read Rani, it’s always good to see how other bloggers do things. I couldn’t even imagine not eating the food, that’s one of the best rewards!! Now I just have to get back into it. Me either…that’s the best part! Look forward to some delicious new recipes from you soon. Thanks so much for coming over to have a read. Oh hey Fleur! Thank you, I’m so glad you found it useful. Once you get going, if you have any questions yell out. Such a good read Rani. 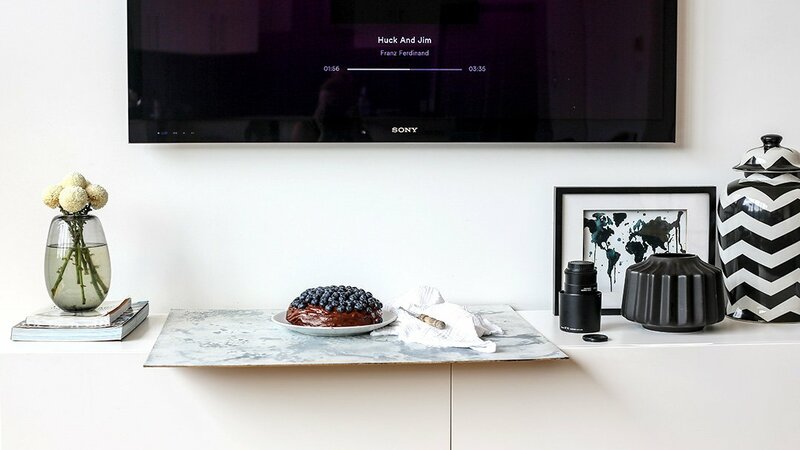 Always love your content, recipes and gorgeous photos (seriously thought you used a professional photographer). Thanks Annalisa! That comment about my photography just made my life. Here to help any time at all. We’re all learning together. I wondered what you’ve been up to all this time ? Thanks so much Susanne. I really hope we get to catch up for an IRL chat one day. What theme are you using? There’s always such a steep learning curve starting out with anything new. Moving to Divi was the same for me. So glad I’m not the only one with a non-fancy bullet journal. Do you think it’s helped with your productivity? I definitely use my time more efficiently now. Really appreciate you stopping by to have a read.